The Equestria Gaming Arcade Has (Finally) Been Restored! Well, it only took us, like, eight months to finally get around to it, but the arcade has finally been fully restored, thumbnails and all! ...Or at least as fully restored as we can manage, anyway. * We've got a whopping 113 colorful horse games to choose from now (over the, like, 24 we had when we started, haha), and I'm sure there'll be more to come over time! So, that all said, what are you waiting for? Go play! *Surprisingly, only one game (!) out of over 100 others has been lost to history, which is admittedly sad but statistically wonderful, all things considered. We'd honestly expected just a bit more difficulty in getting the actual games themselves together; whether that'd be because the only source of a game had died, which is what cost us the aforementioned one game, or because a creator's work had become relatively scattered in recent years, making hunting them down a bit of a chore (lookin' at you, futzi01). Also, we definitely need to change that old banner over to something newer at some point. I never understood what the above is even supposed to represent. What's even happening there? Looks like it's Friday night yet again, folks (oh wow it's almost as if time passes or something), and you know what that means! For this week's Friday Game Night over at CinemaQuestria, things might just get a little ridiculous with a little bit of Cards Against Humanity. Check the usual details below, and enjoy your weekend! While admittedly it might not have a whole lot to start with, the new Lyra's List is finally here! I have to say, we're super psyched here behind the scenes to finally get the ball rolling on such a major site feature again. 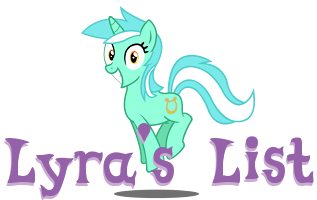 Do keep in mind, though, that we can only keep that ball rolling so as long as you submit something; that said, submissions for the next Lyra's List are open until May 31st , so get to it! Check out this issue's submissions below the break, and happy developing! Reminder: Lyra's List Submissions Are OPEN! Hey folks! Just a reminder that, as the title kinda already gives away, submissions for the next Lyra's List are open! As sad as it is to admit, we simply can't have another Lyra's List if we don't actually, y'know, get anything! If you've been on the fence up to now as to whether or not you should submit something, just do it! It appears that the development group behind the fangame "Pony Amnesia: Love and Mysteries" has come back from the dead; and not only that, they're seeking quite a few folks of different talents to fill their ranks! Check out the supplied information below, and be sure to get in touch with them if you're interested! Writers : We need writers able to write in proper English, with good grammar, little to no misused words, missing, incorrect or overused punctuation, able to follow a format, that has some skill in dialogue, and that would like to work on the genre of the game, slice of life, romance, and probably comedy. Someone who can come up with storylines and convincing social and romantic situations involving the Main characters in the show. We don't need dark and gritty writers, or people who write huge adventures and such, 'cause it's out of the scope of the game. Sketchers : Skilled most importantly in expressions and a bit in poses, as several times they'll need to do floating heads, just showing a different expression. Doesn't matter what you do the sketches on, and they don't need impressive detail, but also can't be stick figures. While they don't need to be carbon copies of the show style, they still need to be mostly show-like to facilitate work to vector artists. Vector Artists : They need to be able to make their vectors look as show-accurate as possible, and when translating the sketch, they don't have to follow the sketch to a T, but make it as truthful to the show as possible, fixing any errors, detail or style related issues in the sketch. There'll be certain guidelines to follow with all the artists to have a more consistent style and make it as less distinguishable as possible between the different artists in play, and all vectors must be presented in SVG files. Background Artists : Again, we need vector artists that can be show-accurate, but in this case, most backgrounds will be the same as the show, and will most likely not need to use sketches and instead, have references and bases from show screenshots and such to draw. Most likely will have to do some of the Mane 6's houses inside and outside, as well as some key-points of Ponyville and not much else. Coders : We could optionally use an assistant coder/script translator, preferably familiar with Ren'Py (or competent enough to get the gist fast), to help with various tasks. Proofreaders and Spellcheckers: We might also have use of people good at spotting aforementioned errors that can happen in writing, to help ease the burden and not require multiple checks by every writer. We would much prefer competent writers, but if you just want to help a little bit this could be an option. Proofreaders and Spellcheckers : We might also have use of people good at spotting aforementioned errors that can happen in writing, to help ease the burden and not require multiple checks by every writer. We would much prefer competent writers, but if you just want to help a little bit this could be an option.